The Stuart Highway runs from Darwin, through the Red Centre, to Port Augusta in South Australia. It splits Australia down the middle and takes you through some of the most iconic destinations you will ever find. An adventure in itself with plenty to see and do. For many, the 2,834 kilometres is a road trip of a lifetime. The first part of our trip starts in Katherine and heads south through Mataranka, Daly Waters, Tennant Creek, the Devil’s Marbles, onto Alice Springs. We will then head south to Uluru, Kata Tjuta, Kings Canyon, Coober Pedy, Woomera, finishing up in Port Augusta. Of course, there are many side trips to be had along the way, but that’s another story. 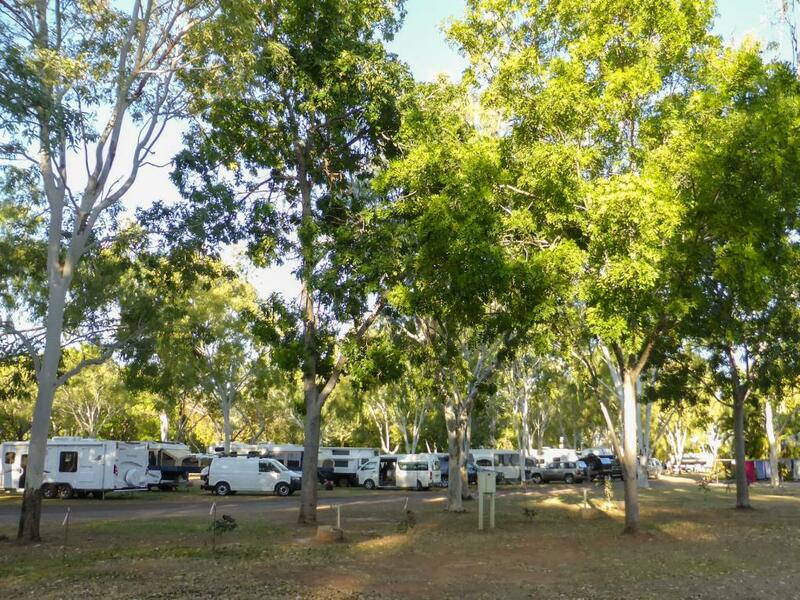 Before heading to the BIG4 Katherine Holiday Park, we called into the Katherine Visitor Information Centre which conveniently provides a parking area specifically set aside for caravans. Across the road is Woolworths, an essential stop to purchase much-needed groceries. This supermarket serves a huge area which encompasses many large cattle stations and a busy RV touring population. We had been warned, this is an extremely busy supermarket and expect a 45 to 60-minute wait at the checkout. We were mentally prepared, with coffee in hand and a positive attribute. We enjoyed our time in the queue and found plenty of interesting people to chat to. While in the queue we spoke to a fellow shopper. He was the author - Dennis McIntosh who has written ‘Beaten by a Blow” (about his experience in the shearing sheds), and ‘The Tunnel’ (about his observations of working-class men working on the underground sewerage tunnels in Melbourne). A fascinating man who was heading to a small community near Katherine to teach. Our time in the queue was not wasted! Key attractions near Katherine include Edith Falls (about 60 kilometres north), and Nitmiluk National Park (Katherine Gorge) where we enjoyed a boat cruise with Aboriginal guides, excellent ambassadors with an amazing knowledge of the local area, the gorge, the plants, animals and local indigenous history. 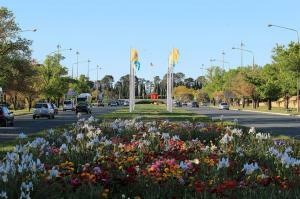 The Katherine markets are held every Saturday morning featuring a range of stalls with fresh local produce. On the road again and down the highway towards Mataranka where we chose to stay at the Mataranka Homestead Caravan Park which is about seven kilometres from town, beside the Mataranka Thermal Pools. These pools flow from the Rainbow springs at a rate of 30.5 million litres a day at a constant 34 degrees. Nice. Hard to believe that so much water travels past each day and easy to understand why this is such an attraction for tourists. Buses stop on their way down the highway for passengers to take a dip before continuing their journey. A very relaxing spot. While in the area you should also visit Bitter Springs and float downstream with the warm fast flowing currents generated by the thermal pools. Leaving Mataranka, we headed south to the iconic Daly Waters Pub, famous for their beef and barra BBQ and live entertainment. There is a dusty caravan park beside the pub, which is full every night with visitors wanting to stay and enjoy the entertainment. The pub is full of outback charm with traveller’s possessions hanging around the walls and ceilings - bras, name badges, coins, hats, shirts etc. We had a Barra burger for lunch - a grilled piece of freshly caught wild barramundi and salad on a bun accompanied by chips - delicious and highly recommended. Back to the highway, a quick stop at the iconic Banka Banka Station and onto the Renner Springs Desert Inn Caravan Park for the night. About 150 kilometres south you come to the well-known Threeways Roadhouse where we enjoyed a break and a well-made coffee. Painted on the outside wall of the roadhouse is a road-train - attached to the front of the painting is an actual road-train bull bar – huge (reminds you to stay out of their way on the road). Just down the highway is Tennant Creek where we spent a night at a caravan park along Peko Road, not far from the Visitor Information Centre. 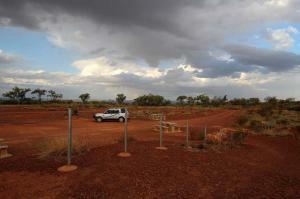 Tennant Creek has an interesting mining history all on display at the Battery Hill Mining Centre. The old Telegraph Station is worth a visit, just to wander around and read the informative signs of how life was at this isolated location. The buildings are surprisingly cool inside with the outside temperature sitting at about 38-40 degrees Celsius. We were lucky enough to be staying at Tennant Creek when the World Solar Car Challenge passed through town. Teams from all over the world race their cars from Darwin to Adelaide - about 3,000 kilometres using only the power of the sun. Very interesting. Of course, our first stop after Tennant Creek was the Devils Marbles, fascinating granite boulders which seem to be precariously balanced on top of one another. They continue to crack and erode away making an ever-changing landscape, and a great photo opportunity. The traditional landowners call them Karlu Karlu (round boulders). Next stop was Wycliffe Wells which is supposedly the UFO capital of Australia! Alongside the roadhouse is a very tidy caravan park with lots of shade and plenty of grassed areas. This is surrounded by barbed wire fencing which I assume is used to keep the aliens out? Some alien figure (models) have been created around the park which provides a bit of fun for photos. On to Alice Springs, which we found to be a perfect place to spend a week or more. We stayed at the BIG4 MacDonnell Range Holiday Park, a fantastic facility with one of the best pool facilities we have seen. We were told the locals stay here over Christmas when the weather in this part of Australian can be scorching! The park also provides a free pancake breakfast each Sunday morning. Awesome pancakes and an excellent way to meet fellow travellers. Must see things in and around Alice Springs include the East and West McDonnell Ranges (a story in themselves), the National Road Transport Hall of Fame, the Alice Springs Desert Park and the amazing Alice Springs Reptile Centre. One word of warning when travelling in Outback Australia, if you ask a local for directions they may say X is ‘just down the road’ – this can range from a few hundred metres to 400 kilometres! You can easily spend a few days exploring West McDonnell Ranges. Must see locations include Standley Chasm which is best seen an hour either side of noon when the sun creates a dramatic effect on the sheer walls; the chasm glows as the sun hits the quartzite walls. Ellery Creek Big Hole is a permanent water hole and a very welcome swimming spot (highly recommended). Serpentine Gorge is a home for large flocks of Zebra finches which can be seen drinking at the water’s edge at sunrise and sunset. Serpentine gorge lookout provides magnificent views of the West MacDonnell Ranges, and a good work-out walking up to the lookout! The Ochre Pits have been used by Aboriginals for thousands of years for decoration. Ormiston Gorge is another welcome swimming hole and provides a well-equipped camping ground, and finally, Glen Helen features a gorge with rock formation which resembles organ pipes. Lots to see in the West MacDonnell Ranges, an area which stretches 140 kilometres from Alice Springs. Uluru (Ayers Rock), Kata Tjuta (the Olgas) and Kings Canyon are accessible from Alice Springs, about 450 kilometres, each way! Motorhomes are a very popular mode of transport for overseas visitors who fly into Alice Springs and drive to our world famous rock. There are signs every hundred kilometres reminding travellers that ‘In Australia, we drive on the left-hand side of the road’. We did spend a week or so exploring this area and were in awe of the sheer size and beauty of these natural wonders – another story in itself. Another, absolute, must see! Erldunda Desert Oaks Resort (roadhouse, caravan park and motel) can be found at the corner of Stuart Highway and Lasseter Highway (about 200 kilometres south of Alice Springs. The Lasseter Highway leads to Uluru, Kata Tjuta and Kings Canyon. We spent the night at Erldunda, a bustling centre with good meals, a baker, an emu farm and purpose-built sunset viewing platform. Locals say “Erldunda is the Centre of the Centre of Australia”. After spending a comfortable night at Erldunda, we once again headed south into South Australia, towards Coober Pedy (only 487 kilometres down the road). Of course, we had to stop at the border for some photos and morning tea. Coober Pedy is another iconic Australian town that needs to be seen to be believed, with remnants of opal mines scattered for miles. Coober Pedy is a very dry part of Australia and water is an extremely precious commodity. Most caravan parks in town do not have water supplied to sites. If you are not carrying water, you can fill up (purchase water) at the Visitor Information Centre via water bowsers which are open 24 hours a day. We stayed the Big 4 Stuart Range Caravan Park which provides under-cover parking for most vans. Great in the hot weather. 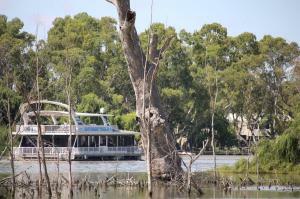 This BIG4 park has one of the best camp kitchens we have seen on our trips around Australia. Of course, Coober Pedy is well known for its beautiful opals, and I suggest a tour of one of the underground mines while in town. 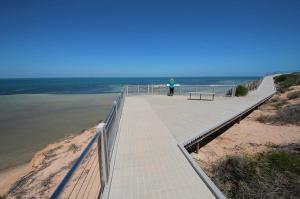 Other must-see things include the Breakaways, Painted Desert and Dingo Fence. The dingo fence stretches for over 5,300 kilometres across three states, built to keep dingoes away from the sheep in our eastern States. Coober Pedy to Woomera was another big day covering about 400 kilometres. Long distance is our choice but rest assured there are places along the way for a short break or an overnight stay. Next stop was unplanned, as we noticed a large salt lake from the road and pulled into the car parking area for a closer look. 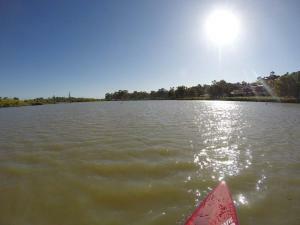 We walked down to Lake Hart, across the railway line, to reach the edge of the water. Salt was crunchy underfoot just as described by Len Beadell in his amusing book on the outback. Apparently, this is only a small lake but seemed huge to us at the time. Next on this trip was a detour just off the highway to visit Woomera which seems a bit like a ghost town these days, but was once a huge part of the rocket testing capabilities of Australia and our allies. Woomera has a range of memorabilia in the local museum dedicated to Len Beadell, the amazing man who opened up large tracts of land in outback Australia. 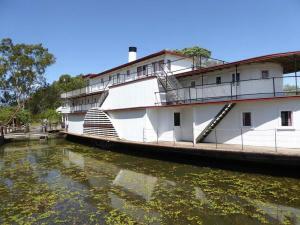 Other interesting places to explore in this area include Andamooka, Roxby Downs and Olympic Dam Mine. The last part of this journey was south towards Port Augusta, through some fascinating scenery, from salt lakes to mountain ranges in the distance. We were advised by fellow travellers to stay at the BIG4 Port Augusta Holiday Park which is large and conveniently located next to the highway. Lots to explore in this part of South Australia, all before heading off to the Flinders Ranges – but, that is another story. 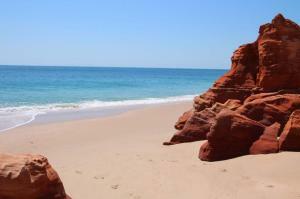 have you used a A road trip through Australia’s Red Heart?